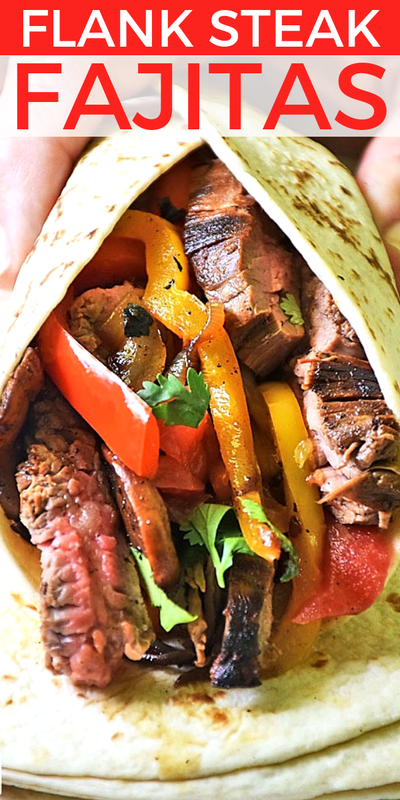 Marinated flank steak and loads of flavorful veggies make a delicious fajita filling perfect for busy weeknight dinners. Tastes great and easy to make! 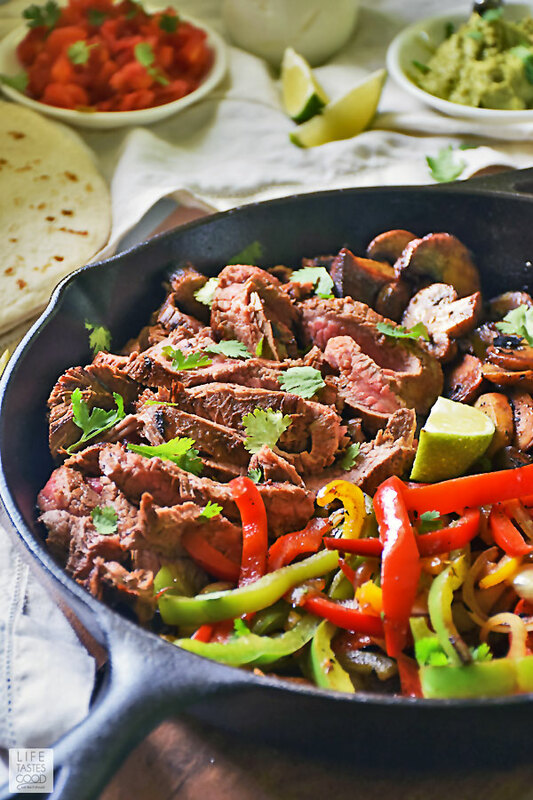 This Flank Steak Fajitas recipe is one of our go-to meals! Flank steak is a lean and boneless cut of beef with lots of intense beefy flavor. Flank steak can be a little tough, so it's important to cook it properly to no more than mid-rare and slice it thinly against the grain for maximum tenderness. Flank Steak is Keto & Budget-Friendly too! 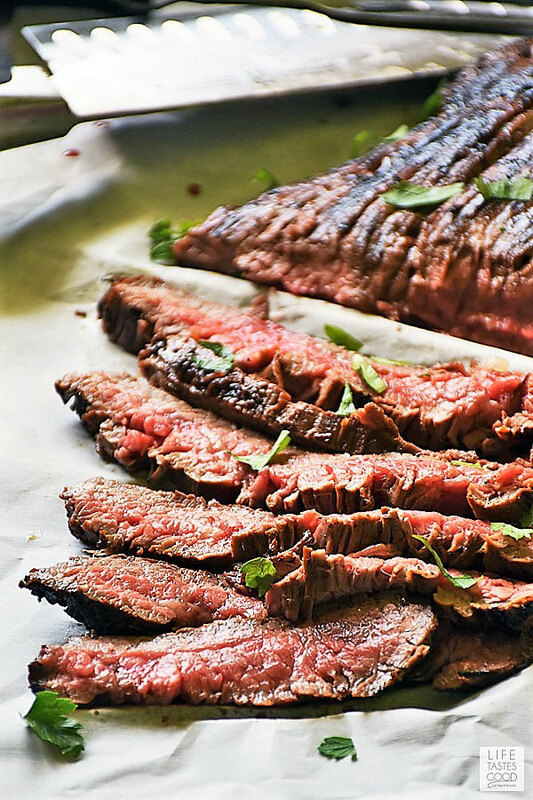 High in protein and low carb, flank steak is perfect for a low carb, keto lifestyle. 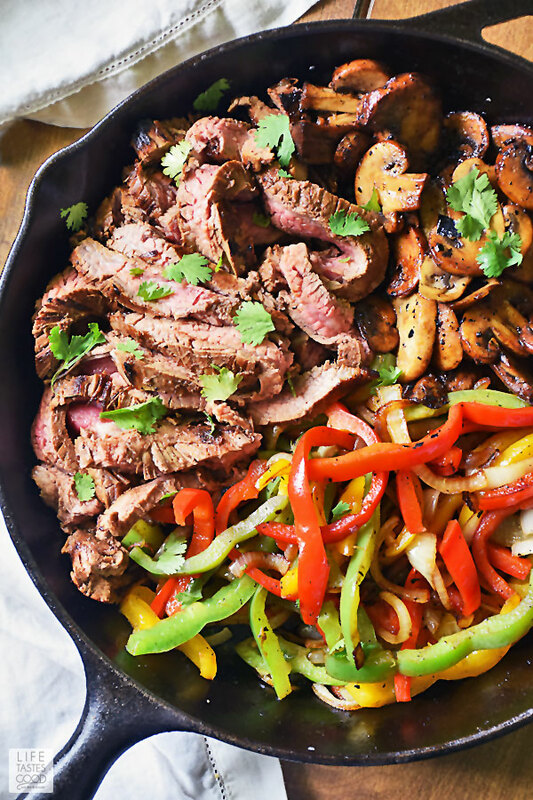 It is also a budget friendly cut of beef, and the leftovers are easy to use in other recipes such as these Flank Steak Fajitas or stir fry, making flank steak a smart choice when meal planning. 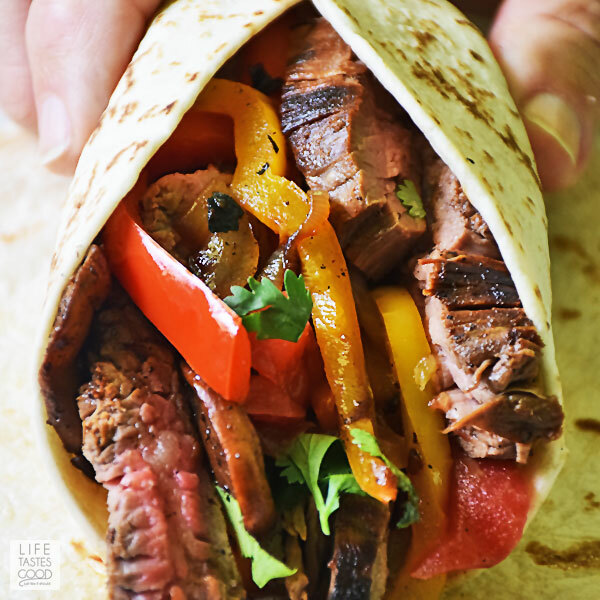 Note: Use low carb tortillas to keep carbs in check for this flank steak fajitas recipe. What is the best way to cook flank steak? Although flank steak can be cooked many different ways, I prefer to marinate and cook flank steak quickly with high heat in a cast iron skillet. Grilling marinated flank steak with high heat is another tasty way to cook it. Visit my Cast Iron Flank Steak recipe for great tips to cook flank steak perfectly every time. While fajitas are more commonly made with skirt steak, flank steak is a more economical cut of beef and a wonderful alternative to skirt steak. Because flank steak is so lean, it is best to marinate before cooking. Although there are several ingredients in my flank steak marinade, it really only takes a few minutes to whisk the ingredients together. It's totally worth it as the flavor really does come through and compliments the flank steak nicely. The acid in the marinade helps to tenderize the flank steak, and the oil in the marinade means you don't have to oil the cast iron skillet when cooking the flank steak. Marinate the flank steak for at least 30 minutes and up to 8 hours. The longer the better. I like to whisk up the marinade first thing in the morning so the flank steak can marinate all day. Place marinated flank steak in hot skillet and sear for about 5 minutes on each side. Remove from heat to rest while making the veggies. In same skillet, melt 1 tbsp butter on medium heat & add 1 pint sliced mushrooms with a pinch of salt. Cook mushrooms until softened. Then add remaining sliced vegetables. Cook over medium heat until veggies are cooked to your liking. Taste the vegetables and add more salt as needed. Slice flank steak thinly against the grain & add to skillet with the veggies. Don't forget to toss the meat drippings in too. No flavor down the drain! Serve with warmed flour tortillas, fresh tomatoes, lime wedges, guacamole, & sour cream. Most home cooks will already have the tools needed to make this recipe as you just need some basics. Here is a list of tools I use when making Flank Steak Fajitas. Disclosure: Life Tastes Good is a participant in the Amazon Services LLC Associates Program, an affiliate advertising program. 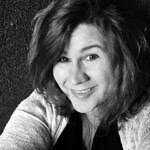 Please note: The following links are affiliate links to products I use and love. 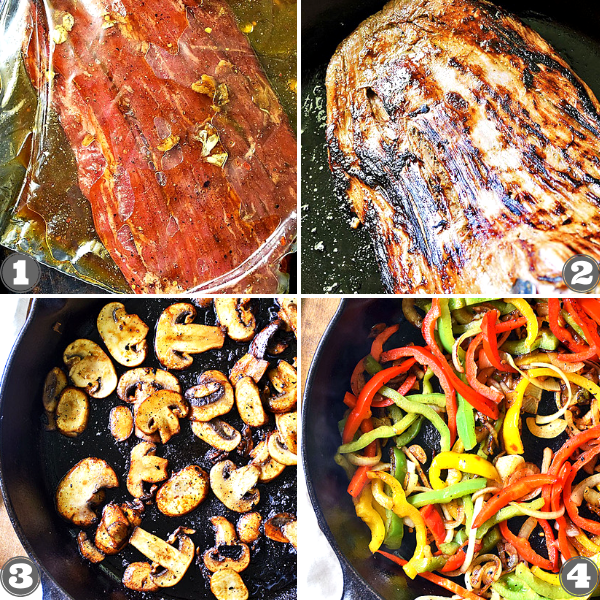 Pin my Flank Steak Fajitas Recipe to save for later! Remove flank steak from skillet and rest 5-10 minutes. Slice thinly across the grain. While the flank steak is resting, melt 1 tbsp butter on medium heat & add 1 pint sliced mushrooms with a pinch of salt. Cook mushrooms until softened. Then add remaining sliced vegetables. Cook over med. heat until veggies are cooked to your liking. Taste the vegetables and add more salt as needed. Slice flank steak thinly against the grain & add to skillet with the veggies. Serve with warmed flour tortillas, fresh tomatoes, lime wedges, guacamole, & sour cream.